← Our God is Greater than All Evil! Our Preacher at Lighthouse Baptist Church recently taught on the Biblical Truth of Jesus’ Birth in Chronological Order from the uncorrupted King James Version. As a Bible teaching and preaching church, we receive this teaching of God’s truths every year, and it never grows old to me. I believe the whole world should at least hear, or read, the truth.When I first learned these truths, I was in shock. Afterall, this is not the story the world tells of Jesus’ birth. This is not what I grew up hearing. But, when I checked God’s Word I found it was not true that the Wise Men should be included in the nativity scene, along with other twists and turns that are not true. The Wise Men were not at Jesus’ birth; they came two years after Jesus was born. Read on and see the truth. 27 To a virgin (unfortunately, some of the newer, corrupted Bible versions change the word virgin to maiden or young woman. If Mary was not a virgin, Jesus was not the Messiah-just what satan would have the world believe!) espoused to a man whose name was Joseph, of the house of David; and the virgin’s name was Mary. 11 And when they were come into the house, (Note: “the house” not stable or manger. Joseph and Mary and Jesus had returned back home to Nazareth where their house was and where they were from.) they saw the young child with Mary his mother, and fell down, and worshipped him: and when they had opened their treasures, they presented unto him gifts; gold, and frankincense and myrrh. 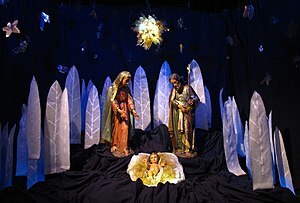 These days it is extremely difficult to find a nativity scene that is Biblically correct, and I have collected nativity scenes for many years. What usually happens when family members and friends learn that you collect something? It becomes a cherished gift to give at Christmas time. The tradition in our home is to take the wise men from the nativity sets and place them in the eastern most corner of our home because they are still traveling on their long journey to see the ‘young child’ Jesus. I would like to wish all of my devoted readers a very blessed Christmas Season and remind us all to truly remember that it is Jesus that is the reason for this celebration.